His skeletal remains were discovered buried under a Leicester car park in 2012 and on 26th March 2015, King Richard III - the last Plantagenet King, was laid to rest in Leicester Cathedral. 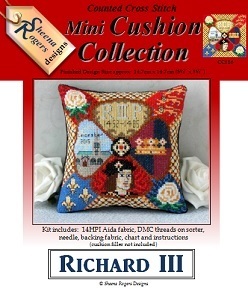 And now you can cross stitch your own slice of history with this mini cushion kit, commemorating this momentous event. The design features fleur-de-lis and three lions from the Armourial shield of the Plantagenet family, plus the plum and navy colours that were placed on the coffin as it passed through Leicester, and also the crown that was placed upon it on reaching its final destination of Leicester Cathedral. This mini cushion cross stitch kit includes: 14HPI white aida, ready-sorted DMC stranded cotton threads on a card sorter, needle, black velvet backing fabric, b&w symbol chart and instructions (cushion filler not included). Whole cross stitch is required to stitch this design, with quarter stitch used on Richard's chin (instructions included), and a fair amount of backstitch.